Review: Imagine a world in which people have the power to go back in time and change history – make the world a different, hopefully better place. Robert Liparulo has created such a world in The Dreamhouse Kings series which culminates in the 6th book titled FRENZY. “No one can make you. But I can tell you, whenever a generation has rejected the responsibility (to fix the past), the world has gotten worse, darker. Think of humankind as a body, a human body. Sometimes it gets sick or injured. If we don’t tend to it – stitch it up, make it right – it gets worse.” This is the mandate of the King family. They live in a home filled with portals to different times in different places. Throughout history, Taksidian has used his powers to engage the world in war thus granting him power. But, the King family won’t stand for it. Xander and David, along with their father and sister, Toria, continue on a quest to find their mother who has been stolen through a portal. But along the way, death knocks at their every door. Is it possible for them to find their mother who could be lost anywhere and at any time in history?! Even if they do find her, will they have the power to stop Taksidian from wreaking havoc on the world? Or, will Taksidian once and for all rid the world of the Kings so that he can finally be the ultimate king? Read the shocking and inspiring conclusion to The Dreamhouse Kings series. Robert Liparulo has created a series that is not only packed with suspense, but is also filled with inspiration. FRENZY is a page-turner that will keep readers up until the wee hours of the morning as they surge ahead through the novel awaiting the shocking conclusion. The protagonists in The Dreamhouse Kings series are easy to relate to – being very much like most adolescent brothers. They have their own identities and passions, they fight with one another, but deep down they will do anything – even die for the other. The antagonist, Taksidian, embodies all the hatred and doubt in the world. But, just having excellent characters doesn’t even begin to explain why Liparulo should be a household name for young adult readers. The entire plot of the series is fascinating. By thrusting the kids into different events in world history, readers are able to bring to life scenes that they might otherwise only read about in a history text. But, Liparulo doesn’t stop there. Instead he leaves the reader contemplating how life would be different if one event had been altered. The Dreamhouse Kings series takes readers in a completely unusual – yet valuable direction. People rarely think about the effects of one small event on the overall world. But, readers of The Dreamhouse Kings series will definitely view the world through a different lens. As exciting as FRENZY is, though, it is imperative to start at the beginning. House of Dark Shadows should be at the top of your young adult reading list. The Dreamhouse Kings series has done for young adults what The Magic Tree House series did for early readers. Once you start reading, you won’t be able to stop until you reach the end. And, even then you’ll hope for more! So, if you’re looking for a series that is filled with all the suspense of R. L. Stein, but still delivers an inspirational message, then look no further – The Dreamhouse Kings series is the place to start. We would like to thank Allen Media Strategies for providing a copy of FRENZY for this review. 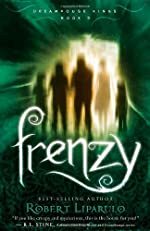 Have you read FRENZY? How would you rate it?